NEW YORK, Aug 23, 2005—The National Elevator Industry, Inc. (NEII) announced today the availability of the latest edition of the NEII-1 Building Transportation Standards and Guidelines on its Web site, www.neii.org. Previously, NEII-1 was only available for purchase on CD-ROM or hard copy. NEII is now offering these standards and guidelines free of charge to everyone online. NEII-1 is the industry reference for architectural and engineering standards, performance standards, electrical standards, and modernization and maintenance guidelines for building transportation equipment. NEII-1 provides standardized information that architects, elevator consultant and building owners can incorporate into building drawings and specifications. The first edition of NEII-1, entitled “Elevator Layout Standards,” was published in 1938. NEII-1 is typically used by architects, engineers, consultants, builders, owners, elevator suppliers and other individuals involved in the specifying, furnishing and installation of new elevators, escalators and moving walks, and maintaining and modernizing existing equipment. Elevator Performance Standards: Machine Room-Less (MRL) Elevator technical applications have been taken into account and performance criteria reorganized to reflect this segment of the market. Temporary Power Guidelines: General power requirements for both permanent and temporary building transportation systems are now available. Temporary Power Supply Guideline Form: This form is intended to aid in the communication of those requirements for typical systems within the power guidelines. Electromagnetic Compatibility Guidelines (EMC): A discussion of EMC issues related to the design and installation of elevator controls and to the placement of other equipment in proximity to them, are now included to assist in compliance with the ASME A17.1 and CSA B44 EMC requirements. Seismic/Flood Requirements Confirmation Form: These forms are intended to assist the elevator supplier to obtain seismic/flood zone data from the building designer. This information is required by the elevator designer to comply with the applicable elevator and building codes. Destination-Orientated Elevator Performance Terminology Matrix: This is a natural extension to the performance terminology in NEII-1 that is applied to destination-orientated elevator designs. 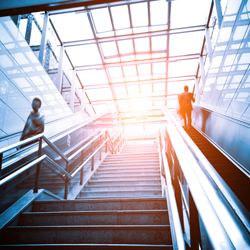 Building Conditions Affecting Escalator Performance: This is a description of building issues, beyond the control of escalator contractors that may have a negative impact on escalator operation. ASME A17.1 Code Data Plate Checklist: TThis checklist assists in preparing the ASME A17.1 and CSA B44 code data plate required for every installation, new or old. Additionally, extensive revisions have been made throughout the document to reflect the latest in building transportation technology. NEII-1 can be accessed by logging onto the Web site’s (www.neii.org) homepage and then clicking on “NEII-1” on the top menu. The newly redesigned Web site also includes updated, in-depth safety and education information for the riding public, as well as easier-to-use communication tools for its members. NEII can also supply a NEII-1 icon and Web link to organizations that want to establish a link from their Web site or company intranet. An application for the icon and permission to link to NEII-1 is available under “NEII-1” at the NEII Web site homepage. The National Elevator Industry, Inc., NEII, is a national trade association representing the interests of corporations, firms or companies that, as part of their regular business, provide or perform any of the following: manufacture (including parts or components used by others in the manufacture, repair or maintenance), install, repair and maintain elevators, escalators, moving walks and related equipment. Trust membership is available to those corporations, firms, or companies who, as part of their regular business, employ members of the International Union of Elevator Constructors (IUEC) and contribute to the benefit trusts (Trusts) established by agreements between the IUEC and NEII. NEII strives to become the leader in promoting safe building transportation, as well as working with local government agencies to encourage the adoption and enforcement of the latest codes and standards.